The HadCRUT global temperature anomaly for 2013 is 0.486. If so it should be outside the 5-95% bands on Ed Hawkins' famous graph. It looks like the 8th warmest year since HADCRUT began and the 8th coldest year in this millenium. Catastrophe looms. I am still amazed by the precision of the HadCRUT, better than 1/1000th of a degree Celsius, what a wonder. Despite the 'homogenisation' of the temperature data by CRU the climate is just not doing wot its spose to. Perhaps HAD needs to find another crew? based on a 2012 figure of 0.45C. 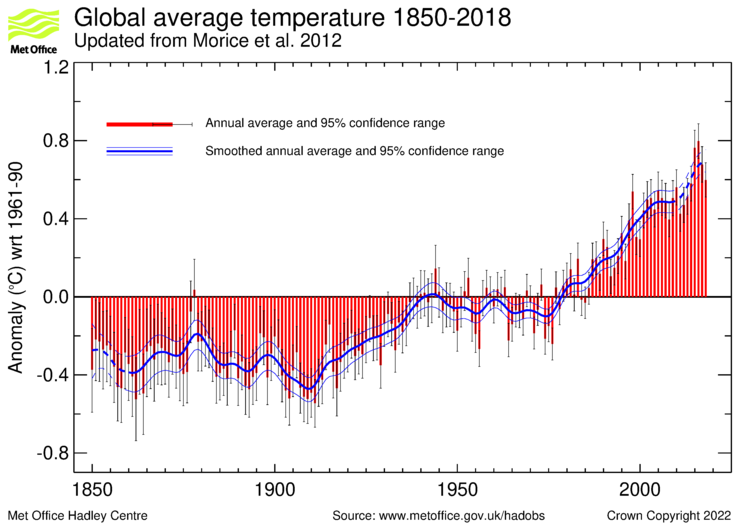 The actual of 0.49C only just above their lower tolerance indicative of the fact that the model is running too warm but the WMO figure, which is an average across three data sets will produce a higher actual figure for 2013 than HadCrut. So are the models running too warm or the data too cool? And yet again a vague MO "forecast" is wide enough for what passes for an "actual" to squeak in at the bottom of the range. "19 December 2013 - The global average temperature in 2014 is expected to be between 0.43 °C and 0.71 °C above the long-term (1961-1990) average of 14.0 °C, with a central estimate of 0.57 °C, according to the Met Office annual global temperature forecast. " Deja vue? Sure looks like they expect a continuation of the "standstill"? The forecast of 0.71C for 2013 was stunningly unrealistic (the warmest year so far being 2010 with 0.547C and a total amount of only two months over 0.7C so far - February 1998 and January 2007). As this absurdity was given for the upper end of the forecast, I wonder whether they considered their 0.43C for the lower end as unrealistic as the upper end? And the result is almost there at the lower end (what people with enough common sense could have predicted). These guys are not for real (scientivists?). What do they smoke? I predict that 2014 anomaly will be between 0.4C and 1,5C. "I am still amazed by the precision of the HadCRUT, better than 1/1000th of a degree Celsius, what a wonder." To be fair HadCRUT reports that taking into account all uncertainties, the anomaly is within approx. +/- 0.1C of 0.486C (i.e.somewhere between 0.385 and 0.591). That's a lot more informative than some time series I could mention. I suspect as you do that the ENSO neutral territory has persuaded them that El Nino is not knocking at the door, which is why they have the same figures for 2014. I had a bet on with Richard Betts, a pint, that the actual would be below the forecast for 2013, it will be interesting to see how that pans out. Does anyone keep tabs on the HadCRUT dataset to check whether the raw data is massaged, tenderised, liquidised and generally cooked up like some of the others? And it's also interesting to see that on decadal scale all three of the first years of the decade have been colder than the first three years of the previous decade. The averages 2001-2003 0.477C and 2011-2013 0,446C. The 13 real-time forecasts made by UKMO for 2000-2012 are discussed by Folland et al., 2013, in GRL. This is a different issue than the climate projections vs. observations (e.g. Ed Hawkins' graph), but since some comments refer to the UKMO forecasts it is worth taking a look at this. They note the the apparent warm bias in the forecasts (though discuss also the possibility of a cold bias in the observations). The correlation between the actual forecasts (i.e. not hindcasts made after-the-fact, but the forecasts issued in advance) and HadCRUT is 0.74 over 2000-2010 and 0.75 over 2000-2011. RMSE of 0.07 degC and a warm bias of 0.06 degC. Suppose for a period of 100 years each year is 0.01C warmer than the last. Every single year for those 100 years would notch up a "warmest year ever" headline. But by the end of a hundred years the average global temp would be 1C higher than at the start. Who'd have serious cause to worry? If the anomaly is within approx. +/- 0.1C, then you should never give more than one significant digit after the decimal point. It is, and always have been, bad practice to do otherwise. It gives a false impression of accuracy, which we know is not there. In the link I provided before the SI rules are very clear about it. 9 warmest years are all basically the same - inside a difference of 0,064C (2010 being the warmest with 0,547C and 2007 being 9th warmest with 0,483C). So (especially with an error margin of +/- 0,1C) it's absurd to rank them. I suspect they are trying to “hide the decline”, i.e. to suppress the fact that natural climate variability appears to have initiated a cooling temperature trend, globally and nationally, around 2005, as this runs counter to the IPCC’s predictions of global warming which they so publically endorse. I’ve written to the Met Office asking for an explanation. The correlation between the actual forecasts (i.e. not hindcasts made after-the-fact, but the forecasts issued in advance) and HadCRUT is 0.74 over 2000-2010 and 0.75 over 2000-2011. RMSE of 0.07 degC and a warm bias of 0.06 degC. This "correlation" is largely a function of the vagueness of the forecasts and therefore says nothing useful. I don't understand your complaint. As far as I can see, both of those charts show the 2013 data point, which of course is quite recent. If you look at the title of the HadCrut4 graph, it says 1850-2012. I think they stopped updating it at the end of 2012. Similarly, the HadCET graph says 1772-2013. I remember looking at just last December and it always gave the current date. I’ve got a saved copy with the title 1772-25th Sep 2013. @NW "This "correlation" is largely a function of the vagueness of the forecasts and therefore says nothing useful." As I understand it, the correlation given is between each year's single "central estimate" forecast and the subsequently "observed" HadCRUT temperature anomaly. So, the width of the forecast uncertainty range (i.e. the vagueness) doesn't affect the correlation. @DougBrodie: the title of the HadCRUT4 graph says 1850-2013 when I look at it. Have you tried refreshing the page? Sven, not only the nine warmest, but the last seventeen years cannot be stated to be warmer than each other if the accuracy is ± 0.1°C. You're not the CRU chappy, are you? When you say "a warm bias of 0.06 degC" is that over the course of a decade? so 0.8C warming with +/- 1C is conclusive prove that we dont need to do anything!! They won't release the raw data. I think it might be on cards like the NOAA ones but yes, they adjust as they all do. It's almost certainly why we are seeing a stall and not a decline. I had this argument with RC a few years ago . All I got back was the usual foul mouth reply + it's an anomaly and therefore can be accurate to 1/1000°C. Fing idiot. It looks like the 8th warmest year since HADCRUT began and the 8th coldest year in this millenium. Wow! I knew climate change could make things hotter and colder, I just never expected it to happen simultaneously. The link to Folland et al. is much appreciated. I agree, the uncertainties given for HadCRUT are helpful and important. You remember rightly—strictly, the exam was to be in time series. Its another game with numbers pay rises running at 2.5 percent CPI inflation rate 2.4 percent. Remind me he who flips coins is called a........? "We discuss 13 real-time forecasts of global annual-mean surface temperature issued by the United Kingdom Met Office for 1 year ahead for 2000–2012." "This observational cold bias was mainly responsible for a statistically significant warm bias in the 2000–2010 forecasts of 0.06°C." 0.06 degC in a year? That would extrapolate to an error of 6 degrees per century... which is an order of magnitude greater than the totality of "Global Warming". Or have I completely misunderstood? Many thanks for the link, I'll have a look at it. That is the thermometer error that you mention. I suspect that the error introduced by choosing a lapse rate to interpolate from station altitude to grid altitude is far larger, specially to a huge 5° x 5° grid. I feel perhaps that ridicule is coming my way. Perhaps that means that the compound error over the decade is 0.06°C. Meaning that the models are only wrong by an extrapolated 0.6°C per century, which is all of the warming we've experienced, give or take. It's hard to tell when the scientific method hides behind a paywall. Is this the way that the discovery of truth is really supposed to work? I think it's pretty shameful. Can anyone explain why the figures for '08 to 12 are increased? The annual forecasts are produced taking into account the current years weather. The central forecast figure for the following year is then measured against the actual temperature. You would expect some years the forecast will be higher than actual and some years lower than actual. The UKMO forecasts are consistently higher and over the period measured give a RMS error of +0.07C. So whatever the forecast that UKMO make, 0.57C for 2014, if you deduct 0.07 you would be closer to actual every time. The GRL paper is suggesting that the reason since 2004 for the error is that the actual temp is 0.06C lower than it should be due to missing data in the Arctic and so the data needs adjusting up rather than the model adjusting down. The annual error between forecast and actual is not fixed at 0.07C, it's basically the average over the period and so cannot be extrapolated into decadal or century figures. Global temperature varies monthly , with a peak during the boreal summer due to increased solar radiation over the northern hemisphere, which has a larger ratio of land to sea than the southern hemisphere. The amplitude of this oscillation is about 5 times larger than the current yearly temperature anomaly. Now, if global temperature has increased due to atmospheric LW radiation, caused by increased CO2 and H2O, this is a different mechanism and should show a different pattern. The amplitude of the oscillation should decrease, with a higher minimum value. "The annual error between forecast and actual is not fixed at 0.07C, it's basically the average over the period and so cannot be extrapolated into decadal or century figures." Why can the annual average not be extrapolated? If there is an average error of 0.07C per year, then the average error can be precisely expressed as being 7 degC per century. That's just a restatement of the numbers. P.S. I do have a degree in mathematics, so I'm hoping for incredible gymnastics in your response. I don't have a degree in mathematics but if the same bias was apparent for a hundred years or a thousand years it would still be an error of 0.07C as the forecast is for one year only and the bias not compounded but 'reset' each time as the forecast is based on actual temperatures not previously forecast temperatures. The common error of divide by sqrt(N). "They" prate about the "Law"(?) of Large Numbers. Applies only if the observations are i.i.d. Independent? Have "they" never heard of auto-correlation? (pace the thought that it's [3,1,0] and not [1,0,0]) And I also thought that "tele-connections" were a big part of Climate "Science"™. "They" use it to justify the tying together of Darwin and a pub in the middle of the Nullarbor. I think that kills the first i.
Identically distributed? Worldwide? The equator (in the middle of a rain-forest at ~0 ft. elevation) versus the highest point in Antarctica? Puh-leze. Tell me "they" are joking. Common errors in Climate "Science"™. But then basic statistics was always beyond them! Focusing on the global average temperature is so yesterday. Why worry about a hiatus in average temperature when there are other more obvious concerns. "these extreme weather events which are now a hundred times more common than 30 years ago are really waking people's awareness all over the world"
OK. Let's just agree that we live on different planets.
" In the longer term HadCRUT is likely to include satellite SST data....."
accuracy to three decimal place for something with some many unknown factors and so many problems ! Its a wonder these people do not do the lottery every week given their 'abilities' how can the fail to win . Basic rule , you can throw as much maths as it as you like , but your chances of being able to give a valid figure which is more accurate then the means of measuring what the figure represents it is the square root of FA. I had the impression that all would be amalgamated into a single WMO data set which the UKMO have increasingly quoted but that doesn't include satellite data as yet I don't think. Obviously the observed data is not as it should be, the models say so and they are never wrong. This warm bias we have been discussing with Richard Betts for many years but I can't recall whether it was prior to 2004, can you? "I don't have a degree in mathematics but if the same bias was apparent for a hundred years or a thousand years it would still be an error of 0.07C as the forecast is for one year only and the bias not compounded but 'reset' each time as the forecast is based on actual temperatures not previously forecast temperatures." 1) Surely 0.07C/year = 7C/century. That's just numbers. 2) You are saying that if a model overestimates temperatures every year (on average) by 0.07C, that equates to the model overestimating by 0.07C every century, and also equates to the model overestimating by 0.07C every millennium. Because the error is 'reset' each year. Either I am totally misunderstanding you, or you are talking the most ridiculous nonsense. I don't rule out the "me misunderstanding" explanation. God knows I have my moments. But wouldn't that imply that if I was overpaid each year by 7p, after a thousand years I would have gained an extra 7p. it's good to know that the HadCRUT team can still manage to chisel out a tenure with their meagre talents.
" I can't recall whether it was prior to 2004, can you?" Don't think I can help LB. We have retrospectively discussed the periods prior to 2004, but I did not get involved until just prior to the damned 2008 Act. Carrying out due diligence on potential investment opportunities that came recommended as "sure fire" because of the forthcoming Act. Found a crock, such a crock that I am still here! Shows you what I know, a lot of money has been made on the back of the Act. However I am still more than happy with my original decision.